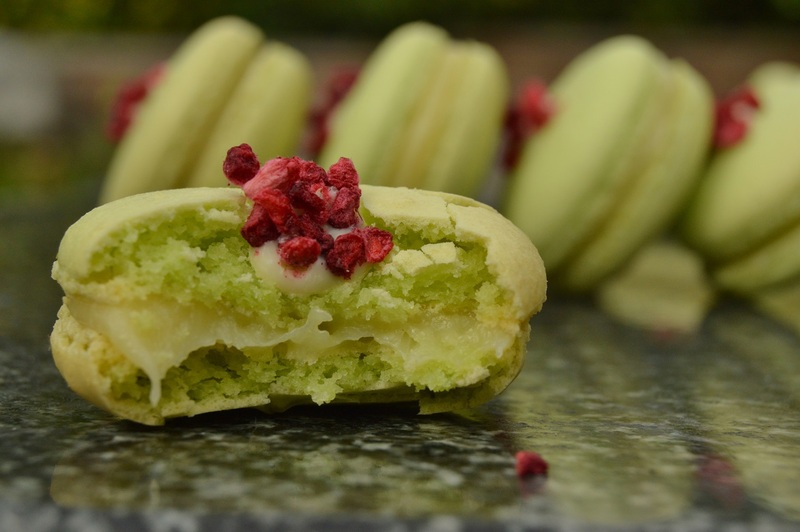 Very different to the English macaroon that can be knocked up in minutes, the more refined French macaron can pose particular challenges for the home baked. Mind you, the humbler English macaroon is decidedly delicious and should not be over-looked! 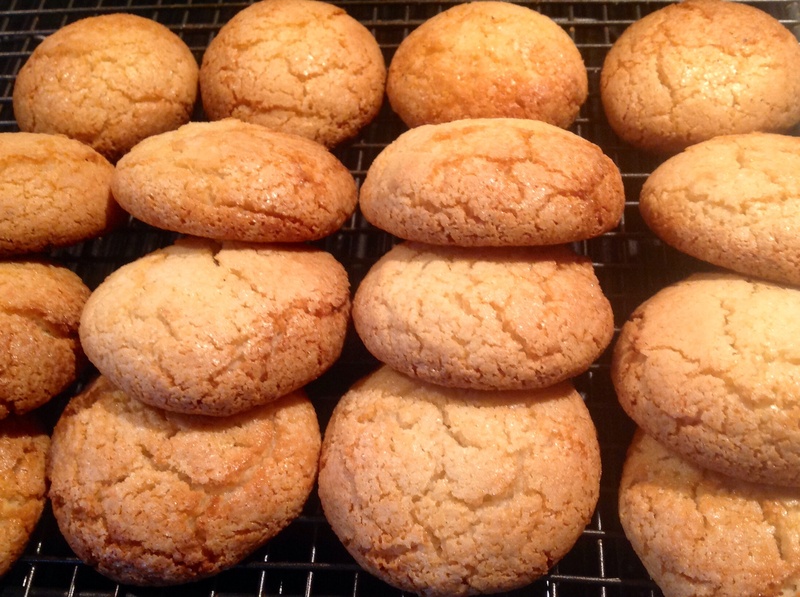 English macaroons: deliciously chewy and necessarily cracked! I had initially dismissed macarons as being little more than pretty little display fillers, not to mention the “how much?” feeling that hit me each time I saw them. Oh but how wrong I was! 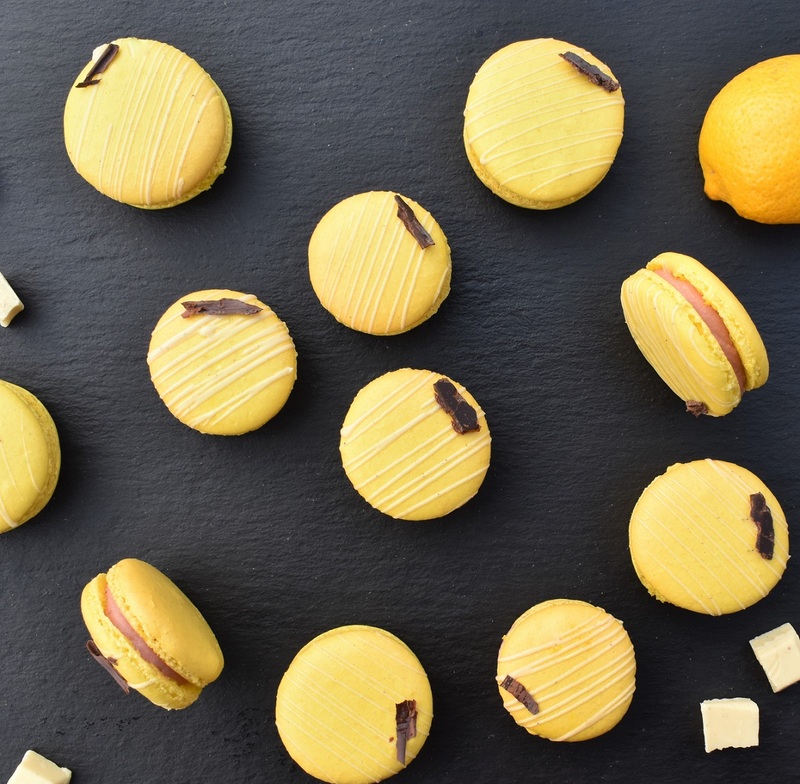 Not too sweet, with a delicate crunch and a gentle chew that then melts in the mouth while giving a powerful flavour kick, a good macaron is something to stand up there proudly as the queen of confections. I do think that making a good macaron – not hollow, with “feet” and with a smooth surface – is a challenge. But the feeling of achieving just that is exhilarating. In my quest to crack macarons, which involved working through scores of recipes (with variable success!) I ended up experimenting with elements of the recipes that seemed to work and adapting from there. 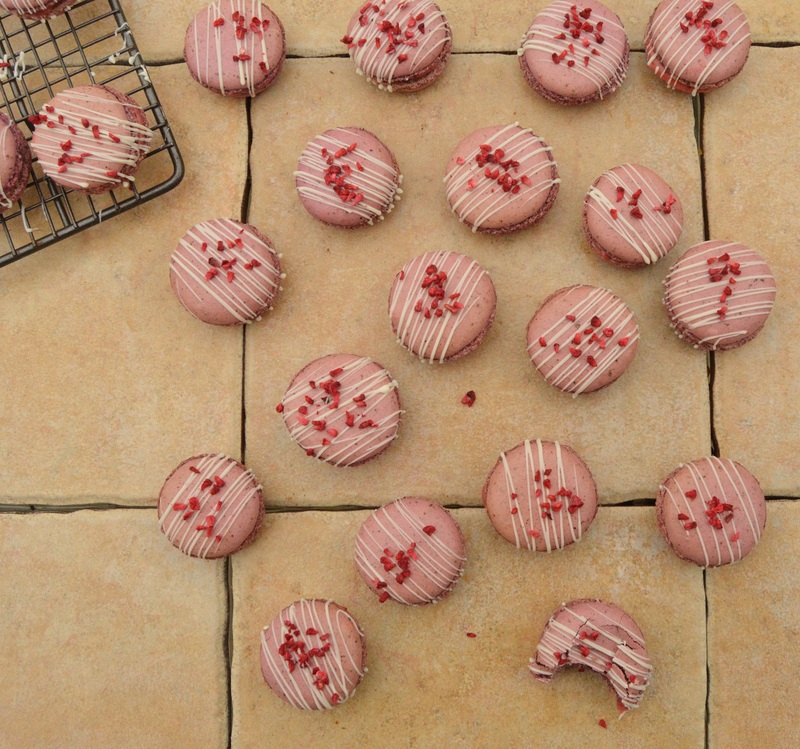 I have been making my macarons using the recipe below for several years now and now very rarely have a disappointing macaron…..saying that, I hope I have not tempted fate! To help achieve perfect macarons every time, I start by weighing the egg whites. The amount of the other ingredients is then based on this. So for 40g egg whites, use 40g caster sugar, 50g ground almonds and 50g icing sugar. Using ready ground almonds is easiest: if you use whole almonds and blitz them in the food processor they can get over-worked, with the oils in the almonds being released. This can affect the macaron texture and appearance significantly. Note: if you want to use other nuts which don’t come ready-ground, such as walnuts or pistachios, just use around half the almond requirement of those nuts, and blitz only in brief bursts to stop the natural oils coming out. For smooth macarons, blitz the icing sugar and ground almonds to give smooth macarons. I like to blitz a large batch of ground almonds and icing sugar together and store this fine powder ready for macarons a later stage. I then have a near-instant macaron mix, needing me only to add the meringue (which only takes moments to make). When I want to use this powder to make macarons, whatever the amount of egg whites I have, I just weigh out 2.5 times this weight to get the amount of this almond/icing sugar powder (see top tip 1 above). Top Tip 4: for uniform sized macarons, the wide end of the piping nozzle is very handy! 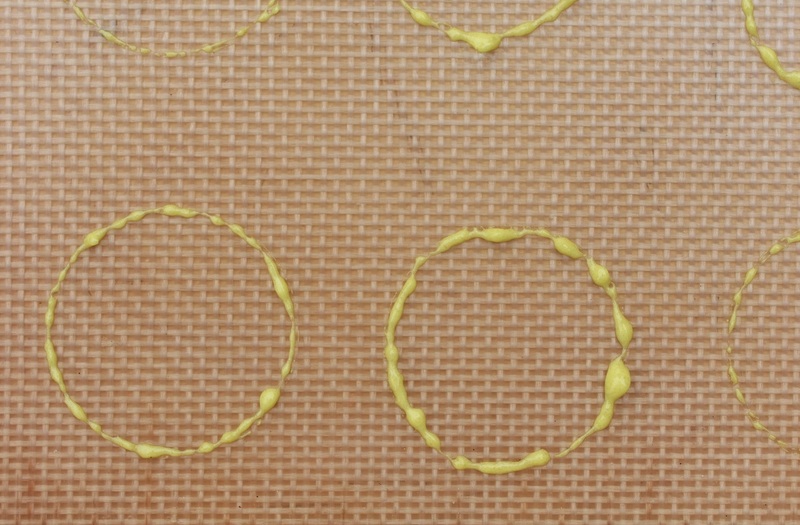 Once the mixture has been made, you can dip the wide end of the piping nozzle into the mixture and dab it over the baking mats, so you effectively have many circle outlines where the macarons will go. You then pipe into the centre of these, and the outlines will form a kind of barrier, preventing them from spreading too far. Resting ensures you get the much-prized “feet”. 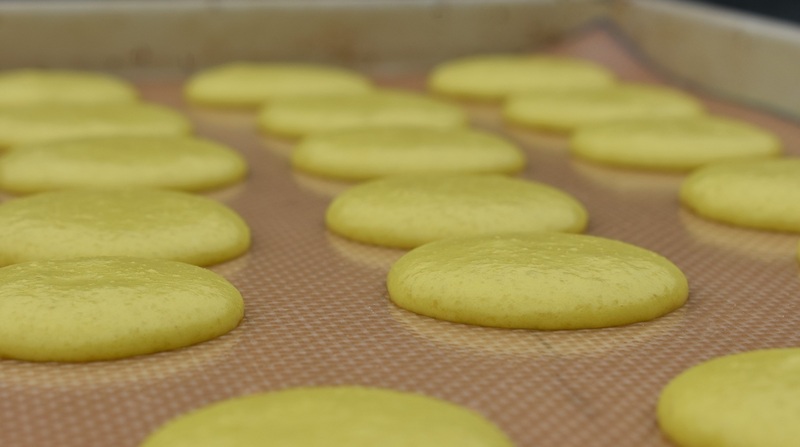 Once the macarons have been piped, leave them uncovered on the work surface for about a hour: the air will dry out the surface of the macarons giving a thin skin. If you gently touch one and it no longer feels sticky, the batch is ready to bake. The skin formed with the resting acts as a protective layer for the macarons as they bake: the heat of the oven causes the macaron to push upwards a little, while the skin firms up quickly in the heat, giving a barrier on top of the macaron, preventing it from rising too much further. As a result, the foot is created. Each time I make a batch of macarons I do a couple of “testers” to check the oven is at the right temperature and the macarons have rested enough. This is particulary useful if using a new or unfamiliar oven! – if it has cracked or there are no feet, place the next tester in to the oven at 140C and check its progress after 6 minutes. Once you have ascertained the best temperature, stick to that and place the main batch on the oven at that temperature. 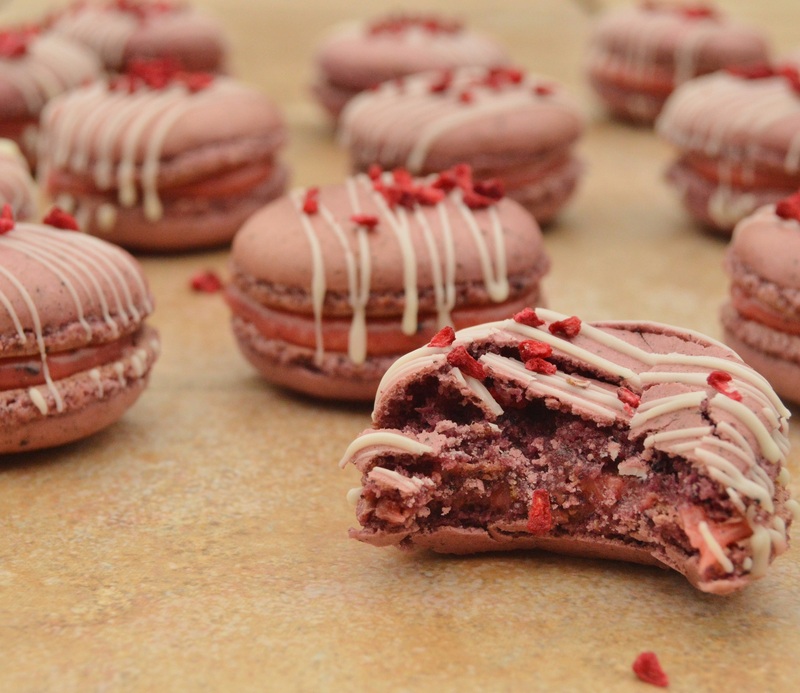 There are many different approaches for making macaron and I have worked through so many recipes, with mixed success, during my quest to perfect macarons. However, I settle on the recipe below which is my combination of the different approaches that are out there. But most importantly for my sanity, it works 100% of the time for me – and in a world with so many uncertainties, it is nice, once in a while, to have a certainty! 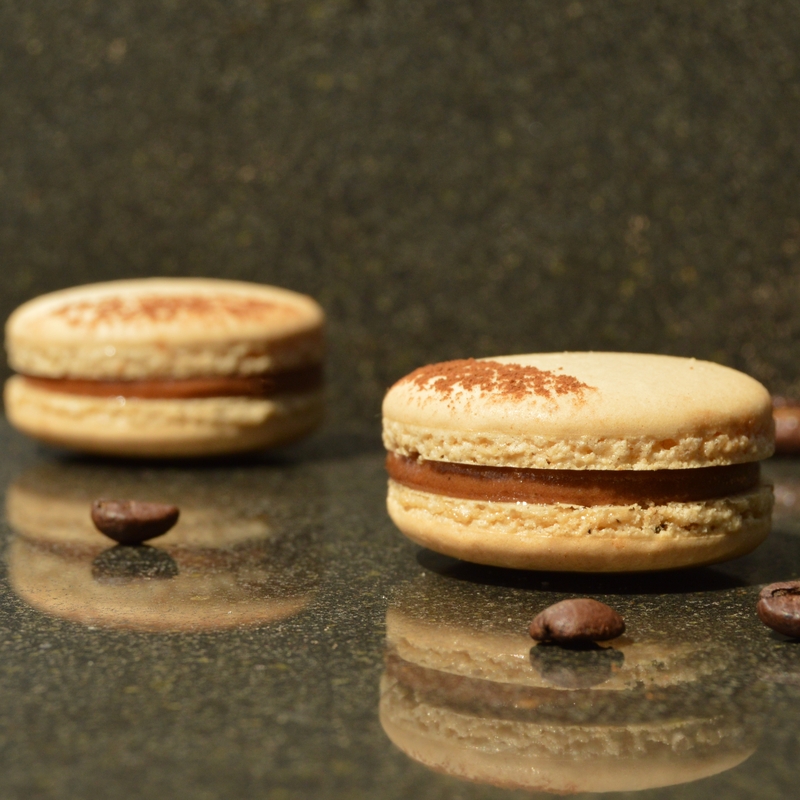 The recipe for a basic macarons is below, with detailed notes and pictures at every stage, along with a few FAQs. 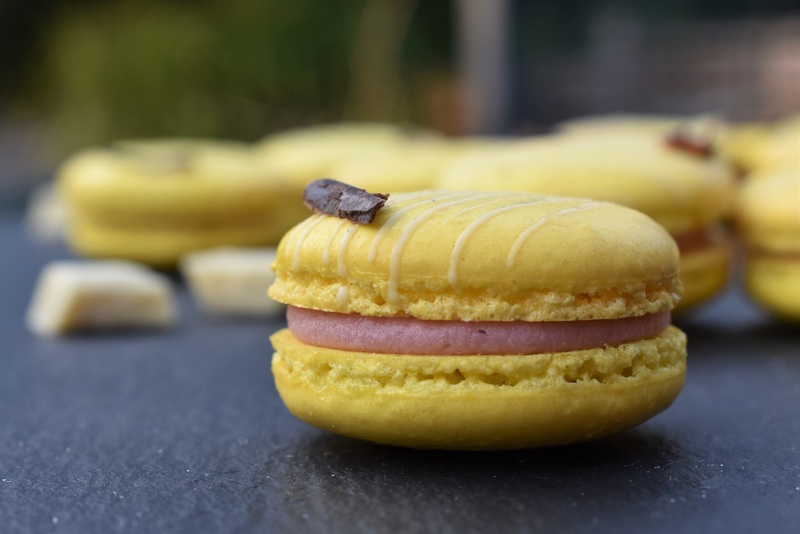 The pictures in the recipe itself are from a batch of lemon macarons I made, but the flavour combinations are endless and the recipe is easily adapted to accommodate whatever flavour you want. (1) Put the icing sugar and almonds into a food processor or liquidiser and pulse for about 10 seconds until perfectly uniform. Sift into a large bowl and re-blitz any lumps left in the sieve. 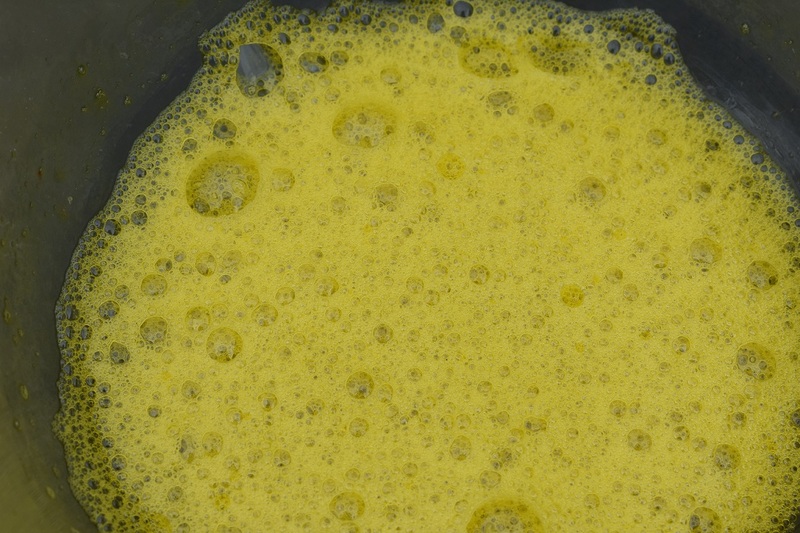 (2) In a clean, dry bowl whisk the egg whites with any food colouring for a few seconds until they go frothy. (3) Add the caster sugar all at once and whisk for about 3-4 minutes or so, until you get a glossy meringue that holds it shape. The meringue should have soft peaks so when you lift the whisk out of it, the peaks just holds their shape. Note: I opt for this French meringue method purely because it is quickest. Some recipes call for the egg whites to be aged. I don’t bother to be honest; I just use the eggs that are to hand and, crucially, at room temperature. (4) Add the meringue to the dry almond/icing sugar mixture. Stir together gently, patting down the meringue into the dry mixture against the side of the bowl as you go, stopping as soon as most of dry mixture is no longer visible. The mixture will feel a little stiff at this point. Note: I use a rubber spatula for this which works well. The key here is not to beat it in, but also not to fold it too lightly as if making a soufflé! 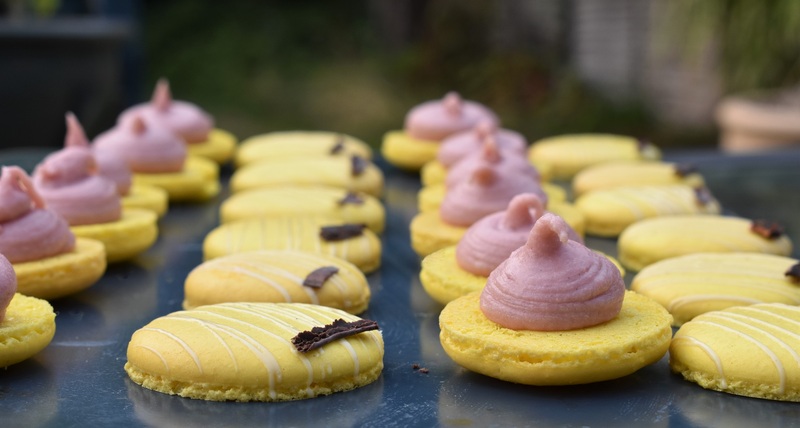 You want to try to knock a lot of the air out of the mixture, which does seem counter-intuitive after making up the meringues; unfortunately too much air in the finished mixture can result in the macaron rising too much and then cracking. By gently patting the mixture against the side of the bowl as you mix, enough of the air will be knocked out. (5) Continue to fold and pat the mixture together gently until the mixture starts to loosen up. 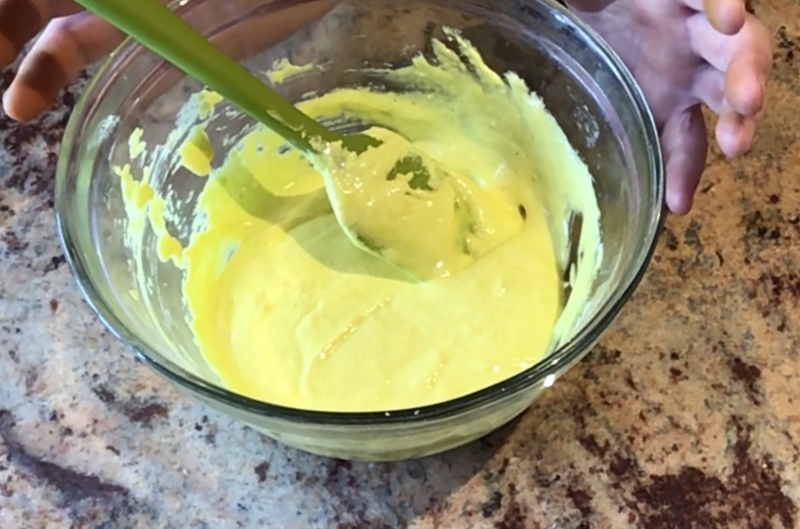 This macaronage stage is a critical part of the process and you don’t want to over-loosen the mixture so that it feels too runny and at all liquid. To test it is ready, lift up the spatula and let some of the mixture on the spatula drops back into the bowl, leaving a trail or ribbon on the surface. If you lightly shake the bowl, this trail should gently merge back into the mixture of its own accord, disappearing within about 30 seconds. Gently rap the base of bowl flat against the work surface a couple of times to help pop any larger air bubbles that might be still in there. blends back into the mixture: it’s now ready! 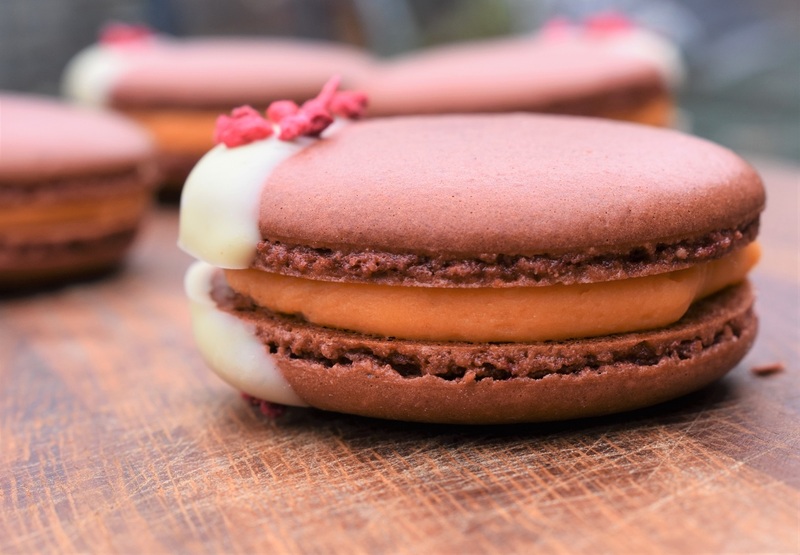 Notes: This stage, the macaronage stage, is arguably the most important part of the whole macaron-making process and, at the risk of sounding melodramatic, the key to success lies with this stage. It is certainly better to under-mix rather than over-mix here and the first few times of making macarons it can be hard to know precisely when you are just there or if you have gone over. Caution is very much the key here! While folding, the mixture changes from feeling fairly stiff to then feeling a little looser within a few folds. Visually, the mixture will change from being slightly grainy-looking to looking smoother and silkier as the natural oils in the nuts get worked. It is at this looser stage that after every two subsequent folds (a bit precise but it does prevent over-mixing!) I lift the spatula a few inches above the main mix and judge how easily the mixture on the spatula falls back into the bowl. Initially it might just plop very slowly back into the bowl, and sit there doing very little on the top of the main mixture…at this stage it is not ready. So two more folds, then try again…. Very soon it WILL get to the stage that when it drops back onto the main mixture it will disappear back into it, within about 30 seconds. 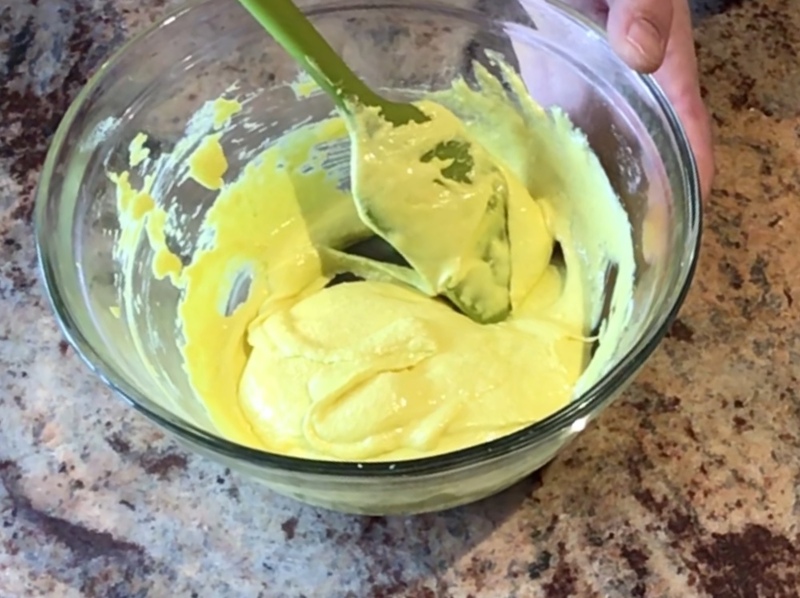 If you over-fold, the mixture will become very runny and the macarons will spread like mad when you pipe them and will probably collide into each other giving a very colourful, but not very helpful meringuey-mess. 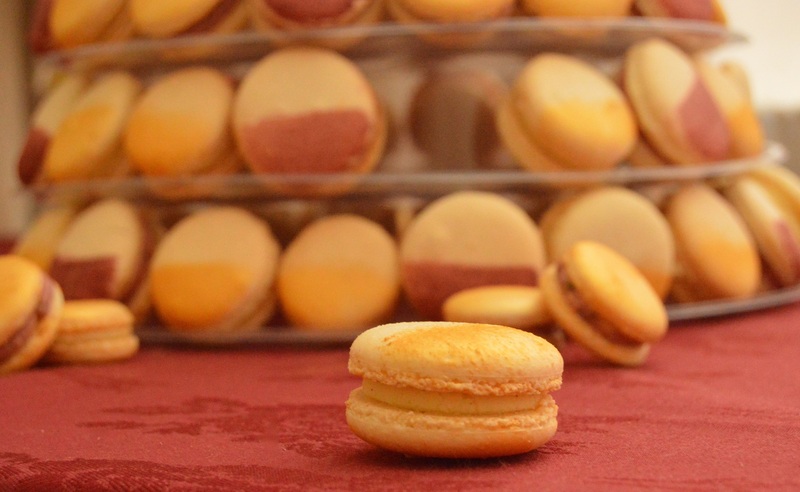 Over-folding is also a common cause of cracked macarons, and even if they do not crack, they are less likely to have those highly sought-after feet. (6) Put flat silicon mats or a double-thickness of non-stick greaseproof paper (stuck to the trays with a little of the mixture) onto solid baking trays. Pipe the required size of macarons onto the paper (see Top Tip 4 above for an easy way to get uniform macarons). You can sprinkle things such as desiccated coconut or tiny freeze-dried fruit pieces over the surface if you wish, but don’t pile too much on there. Note: I have rarely had great results with special macaron sheets but flat silicon mats are my preference. 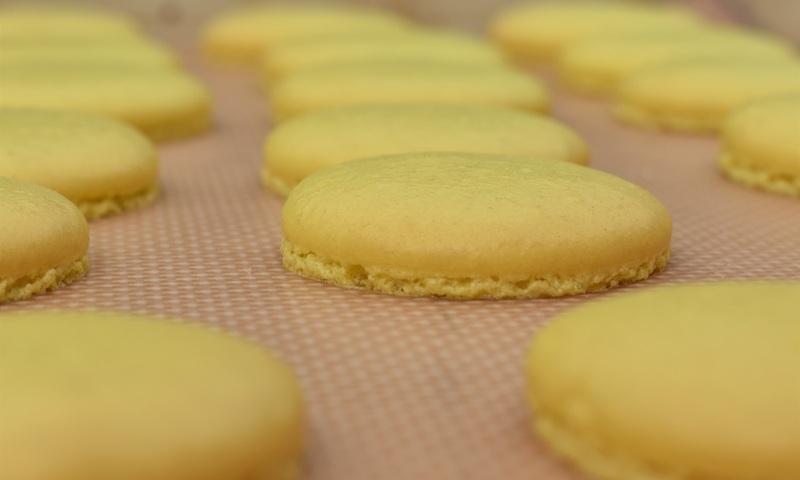 If using greaseproof, it is best to stick the corners down to the tray with some of the mixture so the paper doesn’t flap around in the oven, ruining your wonderful macarons! (7) Lift each baking sheet a few inches off the work surface and drop this flat onto the work surface several times, keeping the tin as flat as possible as you drop it! Note: This will get rid of any more of the larger air bubbles that will invariably still be in the macarons. 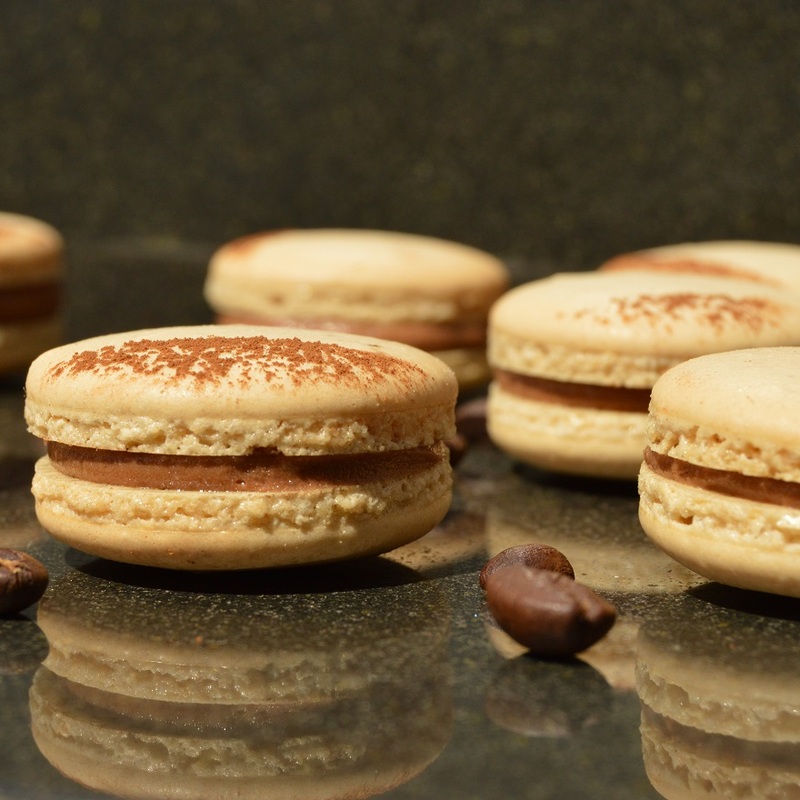 Large air bubbles can cause the macaron to crack in the oven or most likely result in hollow macarons. Normally half a dozen drops does the trick. It is natural for the piped macarons to spread out a little but they shouldn’t run into themselves. You may well see air bubbles form on the surface – some will automatically burst and then the tops become smooth but if there are visible air bubbles that form and do not burst, just prick them gently with a cocktail stick or the tip of a sharp knife. 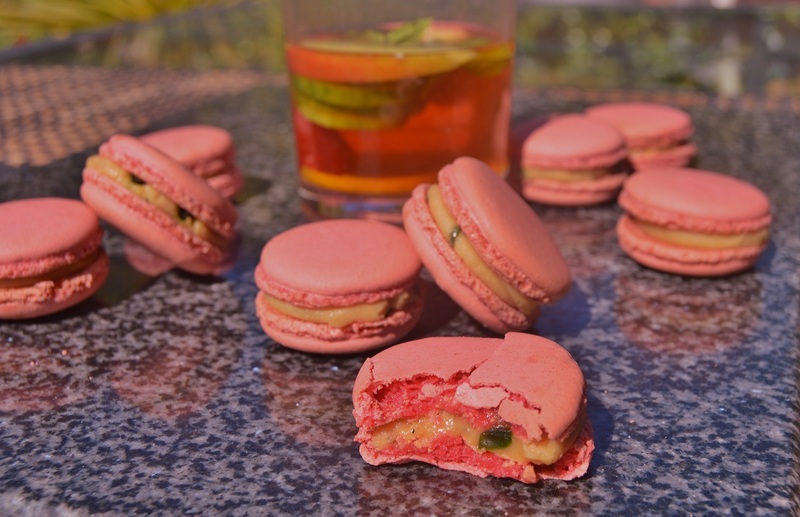 (8) Leave the macarons to rest at room temperature for about an hour or so, until a very thin skin forms on the surface and the surface does not stick to your finger. During this time preheat the oven to 140C (fan oven) or even a little lower, say 130C – see FAQs below. Notes: this resting period is another very important part of the process. Whenever I have rested the mixture, I always get nice feet to each macaron whereas if I have baked some without them having rested, the feet do not always form. After about 45 minutes of resting, gently touch one of the macarons: if your finger sticks to it then a skin has not formed enough so leave it for another 15 mins or so and repeat until it no longer sticks. (9) Bake the macarons for about 12-14 minutes, depending on the size, turning the trays around after 6 minutes. Remove from the oven and leave to cool on the trays before removing carefully. Notes: This is where your tester macarons come into their own! Each oven is different so it is important to get to know your oven as to the positioning of the shelves and the like. For my main oven, 140C is perfect although in other ovens I have used I have gone as low as 130C (fan). In my oven the macarons bake best about half-way and below. I never put more than two shelves of macarons in the oven at a time, and certainly not too closely on top of each other; too many trays can create a build-up of steam in the oven which, in turn, is another thing sent from somewhere wicked to destroy all the loving attention to detail already put into the macarons by this stage! With 1 inch macarons I find that 12-14 minutes in total is about right but on occasion I have had to bake them for several minutes longer. To test, I gently wiggle the top of one of the macarons. If it is too sticky at the feet and looks as if the top will pull straight off I bake for another couple of minutes. I am very strict with myself now in leaving the macarons to cool on the trays, which helps the base crust form fully which in turn makes it easier to remove the macarons. (10) For the fruit filling, mix the ingredients together and leave in the fridge until the mixture has set to piping consistency. You can add more chocolate if you want a firmer set. Spoon the filling over half of the macaron shells and sandwich together gently with the other half. Note: the filling can be changed in any number of ways by using any fruit purée or even just lime or lemon juice. Sometimes I add a little more fruit purée or fruit powder. A buttercream also makes a great filling. (11) Put the macarons in an airtight container and refrigerate overnight before eating. Alternatively, you can freeze them in an airtight container. Note: Maturing the macarons ie) leaving them in the fridge for about day, helps enormously with the texture: the shell will soften somewhat and give the right level of chew, while retaining a nice crispness. They do freeze beautifully: simply stack them carefully in an airtight container between sheets of greaseproof and remove what you want a couple of hours before you want to eat them. Italian meringue, Swiss meringue or French meringue? Each works well but I now go for French meringue every time as it is quicker and I have never had problems with it. I whisk the meringue for about 2 minutes with an electric hand mixer until it is thick and silky, and soft peaks have formed (the peaks flop over easily). Which type of colouring is best? Ideally go for powder colouring, but gel-based is a good alternative. Avoid water-based colours as you need to minimise moisture in the mixture. 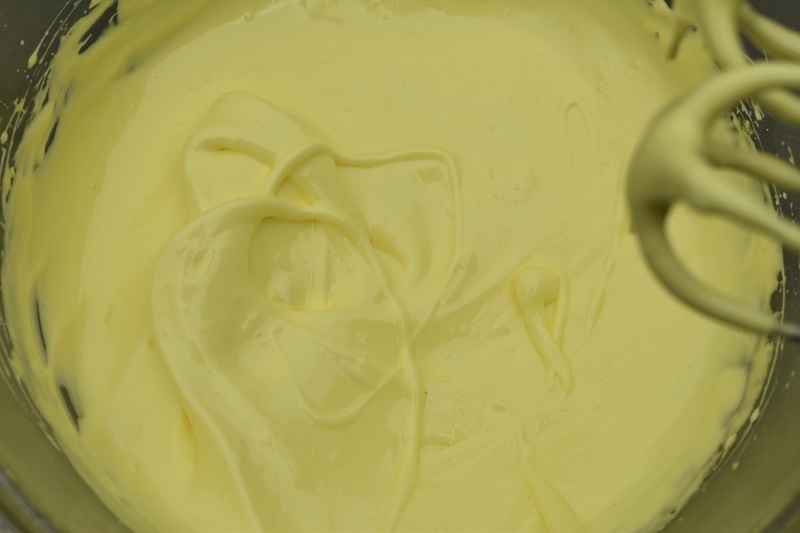 Do you need to use aged egg whites? Ideally use eggs that are closer to their use by date, but I tend to use whatever eggs I have – but they need to get to room temperature. And frozen egg whites work perfectly if left to defrost and come to room temperature. 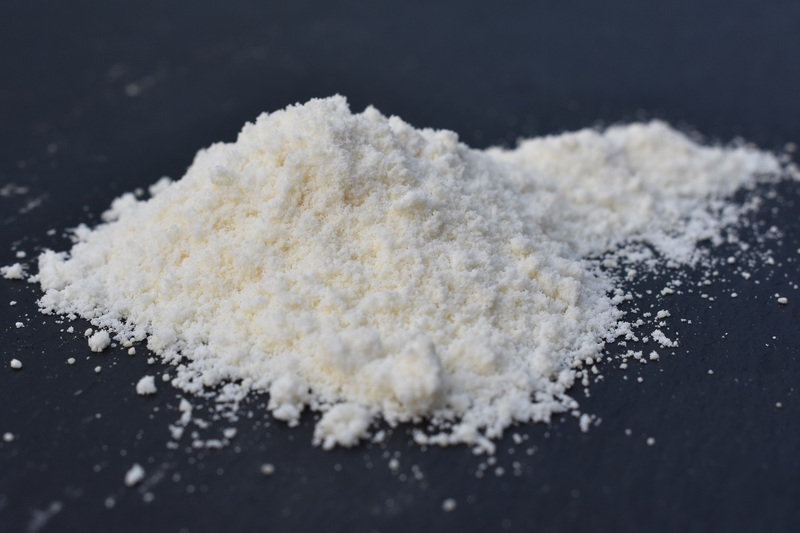 Do you need to use dried egg white and/or cream of tartar? How much mixing is needed? Just enough mixing (patting the ingredients together with a little stirring and folding) to bring the dry ingredients and the meringue together until the mixture loosens up a little. This should not be over-done: see notes under stage 4 of the recipe above for fuller information. Either of these is equally effective: I now have a penchant for the flat silicon mats (not macaron sheets with the holes stamped in/on them). The silicon mats tend to give better, more well-defined feet each time. Why rap the trays with the piped macarons on the work counter? This gets rids of some larger air bubbles so that the macaron will not have an air pocket inside when you bite into them. Jamming a wooden spoon in the oven door while baking the macarons or keeping the oven door closed? This idea is suggested in many recipes, the aim being to get rid of any build-up of steam (an enemy of the macaron!). My door remains shut apart from to turn the trays around about 6 minutes into baking, at which stage any steam in the oven escapes. How to I know what temperature works best for me? Ovens vary so to find out what is ideal for your oven, including positioning within the oven, do a few testers with a batch of macarons you have made up. See Top Tip 4 above. How to I remove the macarons from the trays? I find it easiest just to leave the baked macarons to cool on their baking trays. They then lift off easily IF they had baked long enough – as a test, gently wiggle one and if it shows signs of moving on its base it is not cooked enough. Why are my macarons hollow? This is usually because of over-whisking the meringue at the start. Only whisk until you get soft, not firm peaks. And make sure you pat the meringue into the almond mixture to push out some of the air. Why don’t my macarons have feet? This could be because of several reasons, but most likely one or other of over-mixing or not resting the piped mixture long enough. See the recipe notes above. Why have my macarons cracked? This could also be because of several reasons, but the most likely is over-mixing or baking at too high a temperature. See the notes in the recipe about the oven temperature., including the use of testers. Although I swear by my approach above, that is not to say that other recipes are wrong or are to be avoided – they are not! But I now stick to this recipe purely as a “it’s fool-proof for me” recipe. In fact, I almost dare not look at a different macaron recipes now as I don’t want to be swayed from what I know works for me! But I do look, of course, and I very much enjoy the ideas that are out there…and I still often get the “ahhhh now that’s a good idea” moment! There is an almost unlimited array of macaron flavours, including savoury varieties, but some of my favourites are below. 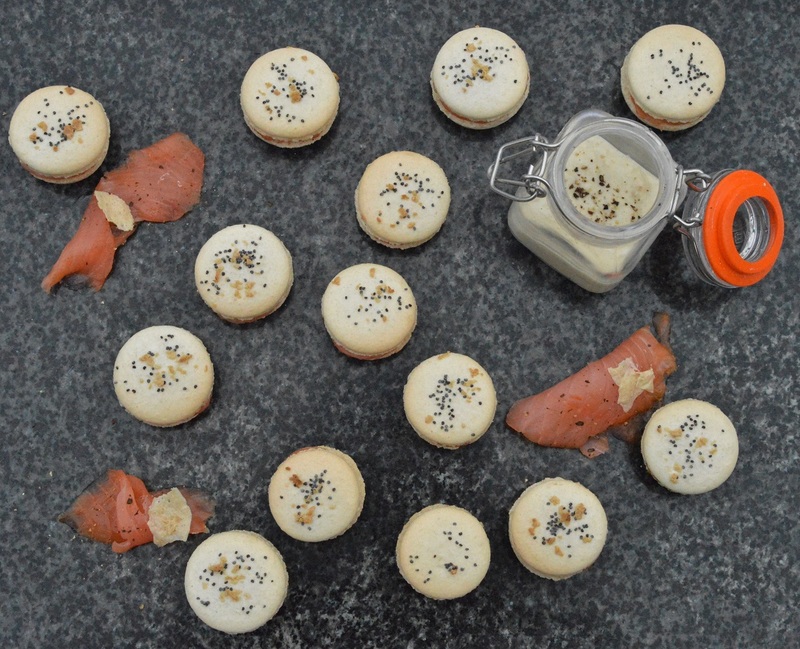 Don’t get put off by savoury macarons. The sweet/savoury contrast between the shells and the fillings can make for an amazing combination. Especially when the filling is intensely savoury, so that it balances with the shells. 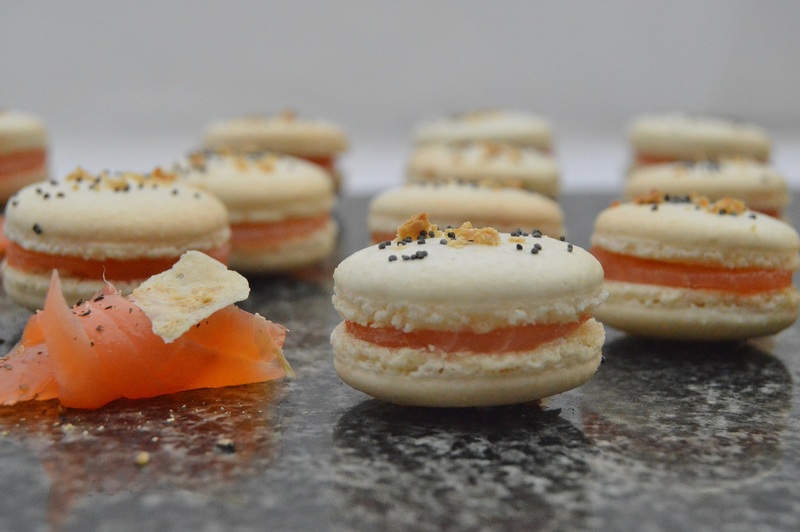 Whenever I have made my smoked salmon and horseradish macarons they have vanished quickly. 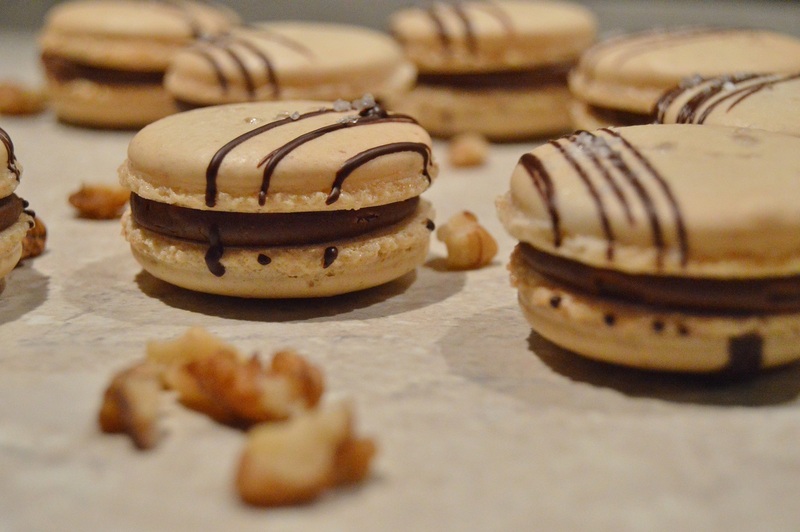 The recipe for these macarons is here. Alternatively, try my roasted beetroot and goats cheese filling, enhanced with a little kick of horseradish. Or my Parma ham, fig and ricotta filling. Details of these are in my savoury macarons post. The filled macarons will keep well in the fridge in an airtight container. They also freeze beautifully for a couple of months or so and you simply take out as many as you want about an hour before you want them and put them in the fridge. If freezing, line an airtight container with cling film, pop in the macarons without packing them in too tightly, cover with a bit of cling film and seal the container. The cling film helps prevent excess moisture getting to the macarons so that they remain slightly crisp and chewy. Beautiful! Definitely going to give these a try! yes do – they are great fun to make and even more fun to eat. Enjoy. 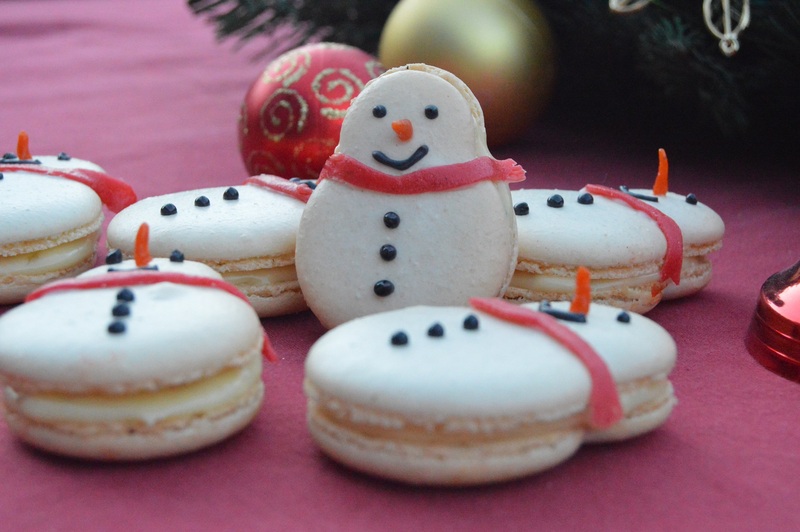 They look fabulous….love the macaroon!!!! dreamy macarons. I will try your approach in the hope that it works for me as I have had little success with them before as they crack horribly or lack their feet. 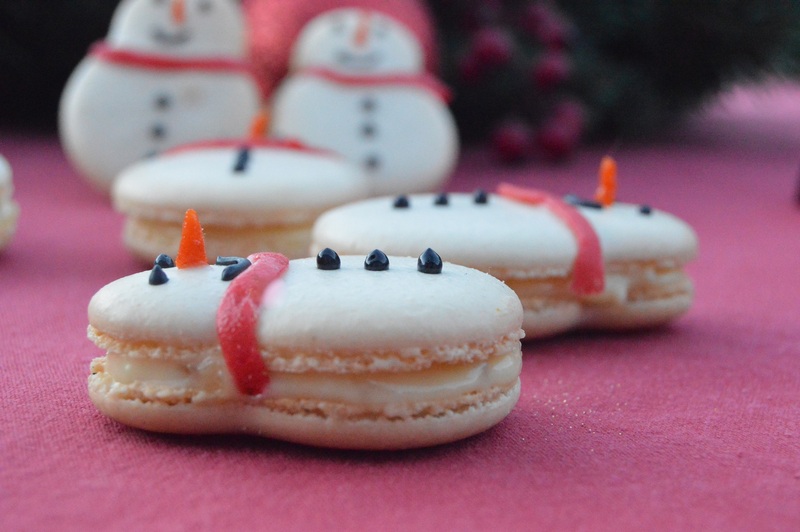 Hi Philip – beautiful macarons! 1. For the fruit puree, I only have frozen fruit. Would I puree the fruit in a blender and then strain? 2. For your salted caramel bittersweet chocolate macarons, I read you didn’t use any food coloring, but the shells have a light tint of color to them? thank you, Ann – and for your questions. 3: absolutely yes to espresso powder: that works a treat – and normal unsalted butter will work well. Next Next post: Pickled shallots – a preserve of great beauty!